This is a scene that is played out across rural America again and again. As farmers retire or die, there is no one to pass the family farm onto because the kids have all moved away to the city to make a living. The farm is auctioned for the land. The building site usually decays for a number of years, perhaps there is a good outbuilding that can be used for storage. Eventually though, the trees are bulldozed the buildings torn down and the acreage is tilled as farmers are forced to grow or get out to make a living. This entry was posted in Uncategorized and tagged auction, copyright ryan ware, corn crib, dovry, dovry mn, family farm, farm, farm site, mn. Bookmark the permalink. Congratulations on launching your blog, Ryan. You know I’m already a fan of your work. 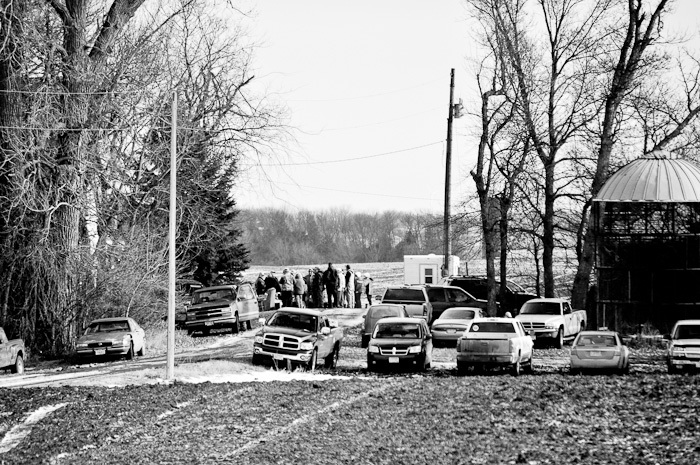 I love this auction image as you have so accurately captured the essence of a farm sale with the clustered pick-up trucks and the bidders gathered in a circle. The circular corn bin on the right brings in the rural aspect and ties the scene together. Stripping the image of color brings the mood of the farmer to mind, how he must feel seeing his life’s work auctioned off. Well done. I look forward to reading more of your posts. Thanks for the nice comments, Audrey. The day I took this photo, I was not aware of the sale, but just happened to be driving by. As soon as I came upon it I knew what it was. It’s something I’ve seen and I’m sure you have too, time and time again since the 80’s.